In this Chapter, the theory of linear systems will be presented. Separated linear systems and diagonalization of square matrix will be discussed first. The linear operator exponentials will be presented. The fundamental solutions of autonomous linear systems will be given with the matrix possessing real eigenvalues, complex eigenvalues and repeated eigenvalues. The stability theory for autonomous linear systems will be discussed. The solutions of non-autonomous linear systems will be discussed and steady state solutions will be presented. A generalized “resonance” concept will be introduced, and the resonant solutions will be presented. Solutions and stability for lower dimensional linear systems will be discussed in details. 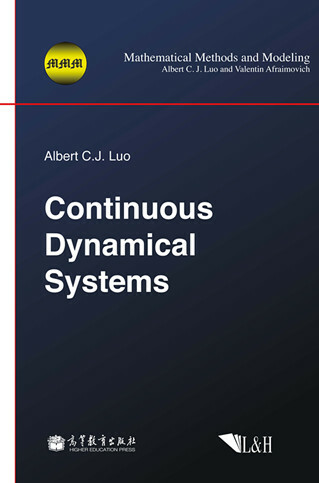 In this Chapter, basic concepts of nonlinear dynamical systems will be introduced. Local theory, global theory and bifurcation theory of nonlinear dynamical systems will be briefly discussed. The stability switching and bifurcation on specific eigenvectors of the linearized system at equilibrium will be discussed. The higherorder singularity and stability for nonlinear systems on the specific eigenvectors will be developed. The lower-dimensional dynamical systems will be discussed to help one understand the stability and bifurcation theory, and the Lyapunov function stability will be briefly discussed. In this Chapter, the analytical dynamics of periodic flows and chaos in nonlinear dynamical systems will be presented. The analytical solutions of periodic flows and chaos for autonomous systems will be discussed first, and the analytical dynamics of periodically forced nonlinear dynamical systems will be presented. The analytical solutions for free and forced vibration systems will be discussed. A periodically forced Duffing oscillator will be discussed as an application to demonstrate the period-m motions in such a nonlinear system. The analytical solutions of periodic flows and chaos are independent on small parameters. The method presented herein will end the history of chaos being numerically simulated only. In this Chapter, the global tangency and transversality of a perturbed flow in dynamical systems with at least one separatrix will be discussed. The local and global flows in perturbed dynamical systems will be introduced through the geometrical intuition. The G(k ) -function ( k = 0,1,2,...) for a perturbed flow to a specified, first integral surface will be introduced. The definitions of the global and tangential flows will be presented, and the sufficient and necessary conditions of such global and tangential flows to the separatrix will be developed via the Gfunctions. Such conditions give the global tangency and transversality of flows to the separatrix surface in nonlinear dynamical systems. The perturbed Hamiltonian system will be discussed. A periodically forced, damped Duffing oscillator with a separatrix will be presented as an example. In this Chapter, nonlinear Hamiltonian chaos including stochastic and resonant layers in two-dimensional nonlinear Hamiltonian systems will be presented. The chaos and resonance mechanism in the stochastic layer of generic separatrix will be discussed that is formed by the primary resonance interaction in nonlinear Hamiltonians systems. However, the chaos in the resonant layer of the resonant separatrix will be presented that is formed by the sub-resonance interaction.